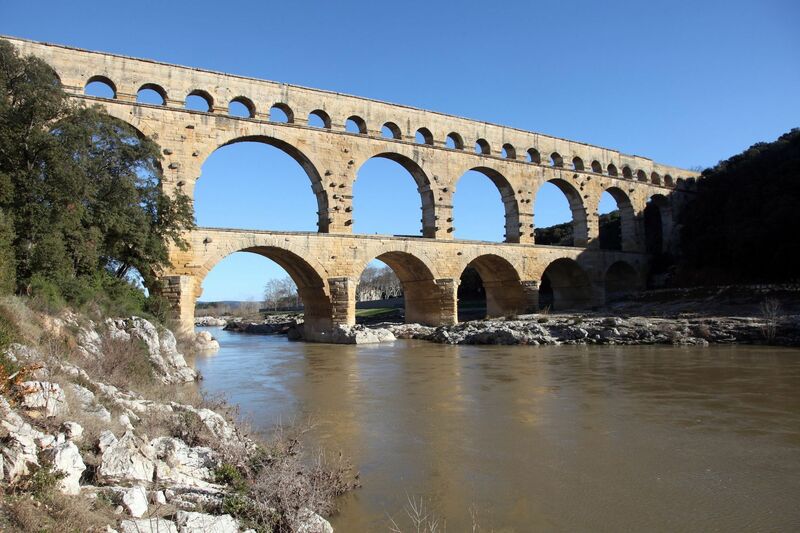 The Roman aqueducts supplied fresh, clean water for baths, fountains, and drinking water for ordinary citizens. This is the Roman aqueduct of Pont du Gard, which crosses the Gard River, France. It is a UNESCO World Heritage Site. The Roman aqueduct was a channel used to transport fresh water to highly populated areas. Aqueducts were amazing feats of engineering given the time period. Though earlier civilizations in Egypt and India also built aqueducts, the Romans improved on the structure and built an extensive and complex network across their territories. Evidence of aqueducts remain in parts of modern-day France, Spain, Greece, North Africa, and Turkey. Aqueducts required a great deal of planning. They were made from a series of pipes, tunnels, canals, and bridges. Gravity and the natural slope of the land allowed aqueducts to channel water from a freshwater source, such as a lake or spring, to a city. As water flowed into the cities, it was used for drinking, irrigation, and to supply hundreds of public fountains and baths. Roman aqueduct systems were built over a period of about 500 years, from 312 B.C. to A.D. 226. Both public and private funds paid for construction. High-ranking rulers often had them built; the Roman emperors Augustus, Caligula, and Trajan all ordered aqueducts built. The most recognizable feature of Roman aqueducts may be the bridges constructed using rounded stone arches. Some of these can still be seen today traversing European valleys. However, these bridged structures made up only a small portion of the hundreds of kilometers of aqueducts throughout the empire. The capital in Rome alone had around 11 aqueduct systems supplying freshwater from sources as far as 92 km away (57 miles). Despite their age, some aqueducts still function and provide modern-day Rome with water. The Aqua Virgo, an aqueduct constructed by Agrippa in 19 B.C. during Augustus’ reign, still supplies water to Rome’s famous Trevi Fountain in the heart of the city. a pipe or passage used for carrying water from a distance. physical force by which objects attract, or pull toward, each other. series of links along which movement or communication can take place. having to do with the civilization of ancient Rome, including the kingdom, republic, and empire.